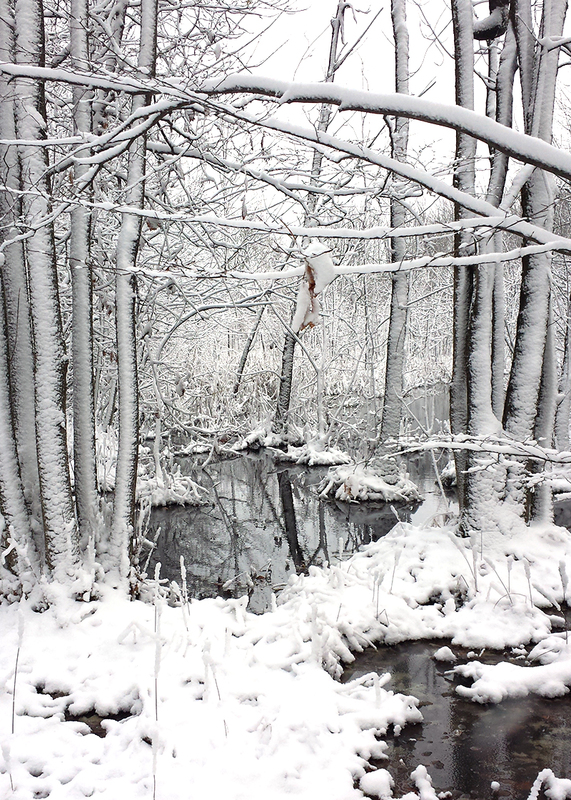 We woke up to this season's first snow and it was extraordinarily beautiful. 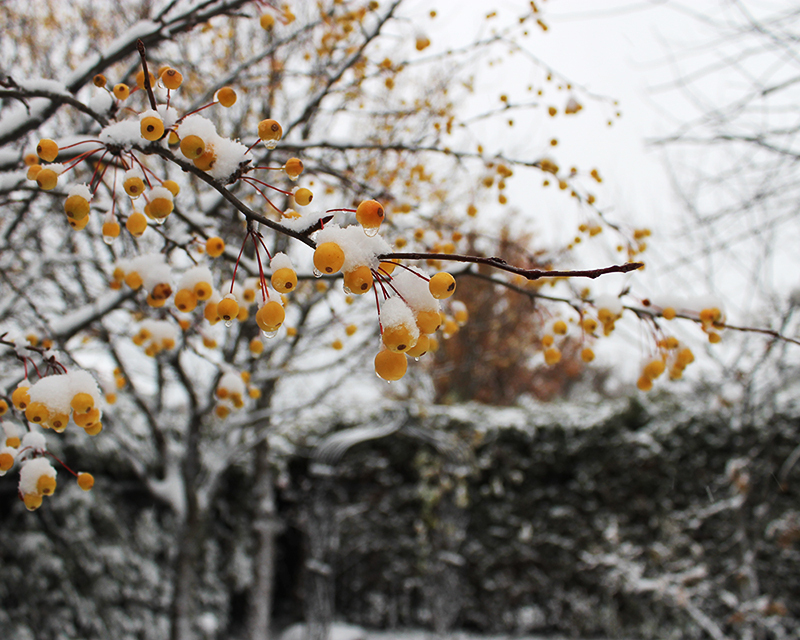 These are crabapples on a row of small trees in our backyard. This variety is called Sir Lancelot. The tiny yellow fruit remind me of jewels. It is particularly nice at this time of year to be left with bits of colour after the leaves have fallen from the trees and shrubs. 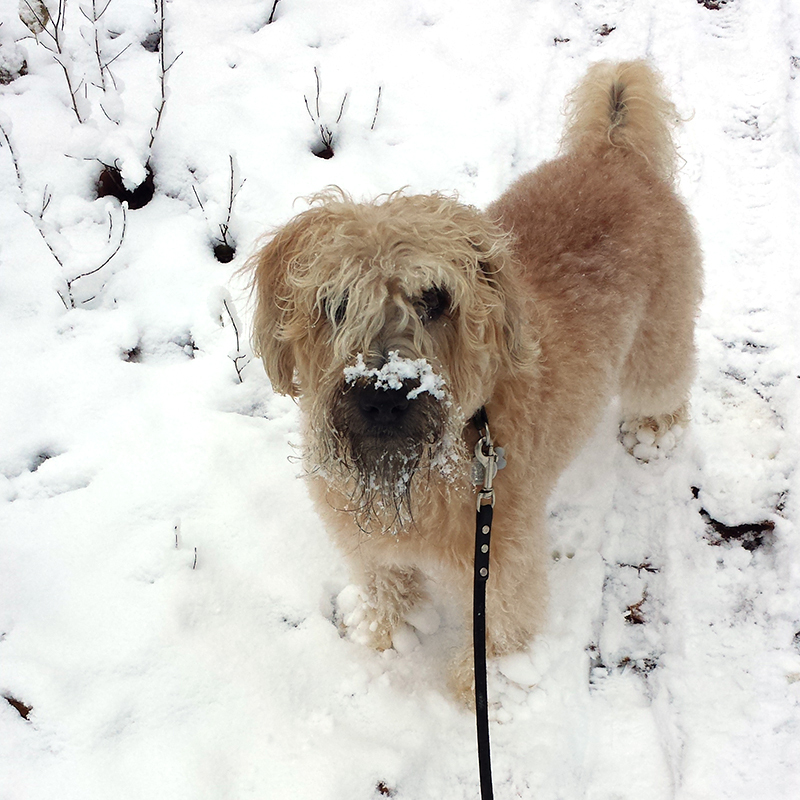 Meeko was very excited to see the snow and did two crazy fast loops of the backyard in celebration. I was able to convince Chloé to accompany us to the forest for a morning walk before she headed downtown for her classes. I'm so glad we went as it was absolutely enchanting. 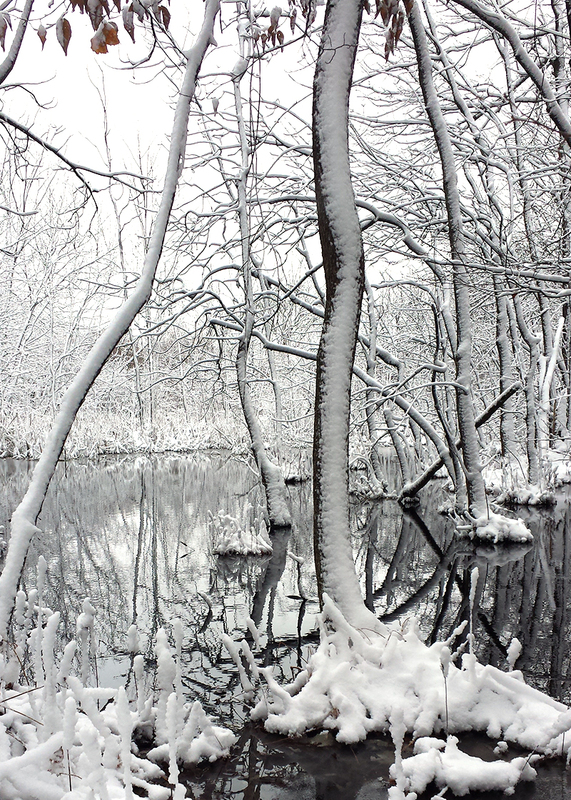 All of the trunks and branches of the trees were covered with snow. These photos were taken in colour (you can see a bit of colour in the leaves at the top) but they look like they were taken in black and white. The marshy areas border parts of the pathway through the forest. As Chloé and I drank the beauty of the morning in with our eyes, Meeko dipped his nose in it. To each, their own form of celebration! If you'd like to visit my shop, please click here. Autumn days are truly here. The weather is cool and crisp. It's perfect for long, lovely walks. Many leaves have fallen and are providing that wonderful 'crunch crunch crunch' underfoot but there are still lots of leaves on the trees giving beautiful colour. We must be at the magical midway point. 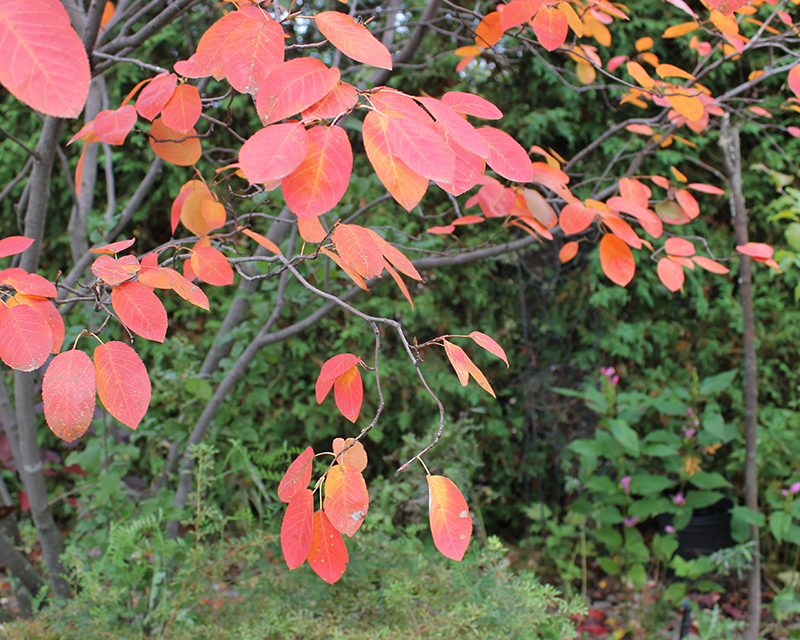 The leaves above are on one of my serviceberry bushes. I have a few of them around the yard, both in shrub and small tree form. Their fall colour is hard to beat. 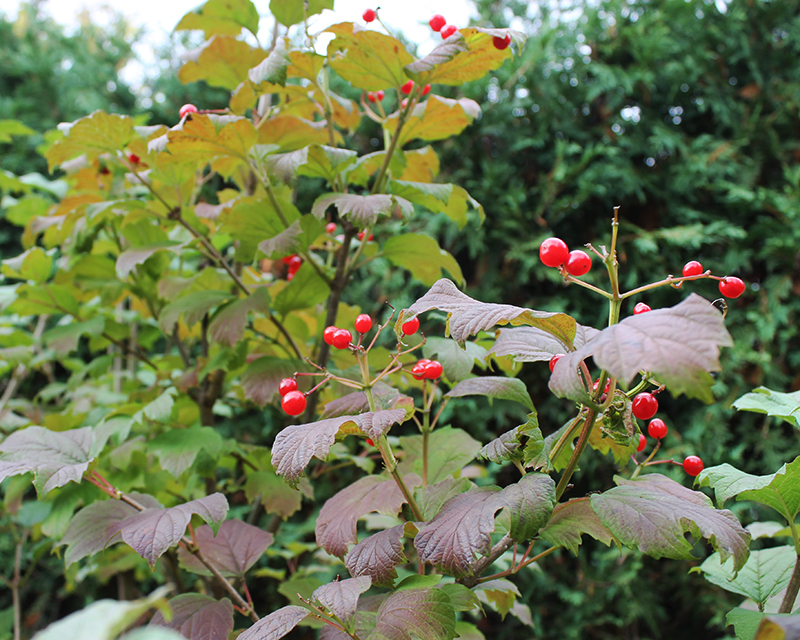 Below is my viburnum trilobum which is on the brink of turning red-orange. Those berries won't last long once the birds figure out they are there. Our town is edged by rural roads and fields. It's one of my favourite places to walk with Meeko. The cloud formations are often beautiful and there is a feeling of openness that you don't find even just a few streets away. It's a thinking and breathing place for me. I'm pretty sure that Meeko mostly thinks about the horses we see along the way. A few weeks ago, I told you about my 2017 calendar. I'm so proud of it. It is truly a labour of love. 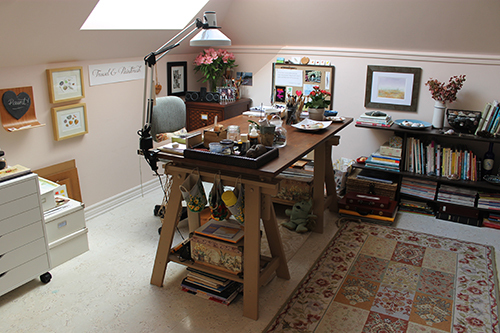 Many, many weeks went into the creation of the paintings and the calendar is printed page by page by me in my studio. One challenge I've found is that it's hard to take a photo that gives a really good sense of a 12-month calendar. This morning I worked on Photoshop (actually until my eyes felt cross-eyed) making this poster of my calendar. I hope it gives you a full idea of how pretty it is. I originally only offered my calendar unbound which can be displayed leaning on a bookshelf, on a fridge with a magnet, or on a wall with washi tape, a clip or push pin. Some people said they would like it bound so I now also offer a version with holes punched in the centre and a loop of twine. Something for everyone! You can order the version you prefer here. I am happy to announce that my edible flower watercolor series is now available as prints in my shop. I really enjoyed painting this collection of flowers. I have printed them in my studio on beautiful paper. I mean paper so nice that you will want to sit there holding it instead of putting it in a frame. Or at least I would. Because I love paper that much. A little while ago, I wrote about how I am trying to paint more series. I did it! 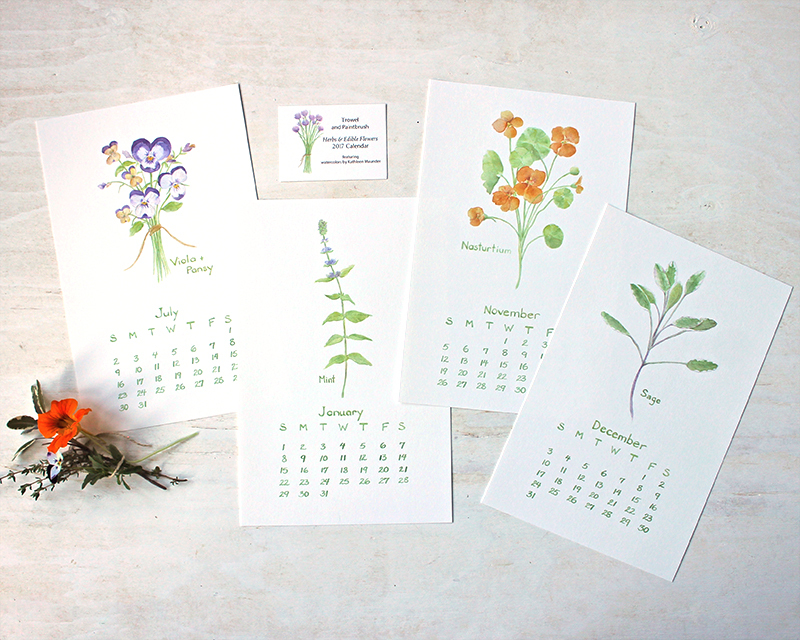 These six edible flower prints are compatible with my herb series. I hope by having related images available that it will be easy for people to mix and match to create a collection of prints that is just right for their wall. Viola + Pansy - The flowers of these charming plants are edible. They can be added to salads or crystallized and used to decorate cakes. Crabapple - The petals of crabapple blossoms are edible (apple blossoms too). I was delighted to learn this! They can be used in small quantities to garnish a salad or try floating them in a drink. Borage - I grow borage from seed every year. It's such a pretty addition to the garden. I love all blue flowers! 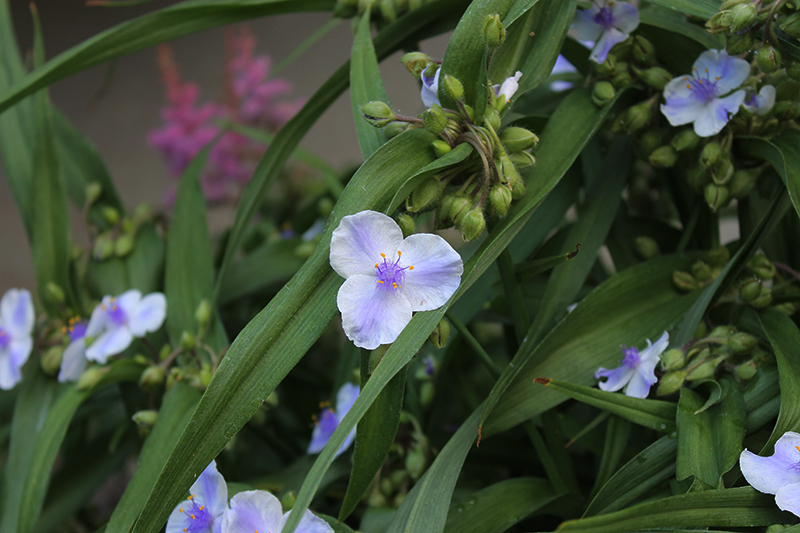 The flowers are edible and can be used to garnish salads and cold soups. You can float them in beverages or freeze them in ice cubes. The young leaves are also edible but I don't really enjoy how prickly they feel so I leave them on the plants. Chives - The stems of chives are a great, mild substitute for onion in foods. They are nice with egg and cheese dishes and are lovely baked into biscuits. I never used to think of eating the blossoms until I saw a photo on my friend Sonia's beautiful Instagram feed a couple of years ago. She was preparing toast topped with soft cheese and chive florets. I tried it and not only is it delicious but also beautiful! Nasturtium - This is another beautiful flower that I grow each year from seed in my garden. I line the sides of my square-foot garden with nasturtiums. The flowers have a peppery taste and are great in salads or as a garnish. The young leaves are edible too. Violet - Wild violets are edible. I'm lucky to have some growing wild in our back lawn. Many people like to crystallize them and use them to decorate cakes and cookies. I really hope that like my new edible flower series. You can also find smaller versions of these images in my 2017 calendar. I should mention that it's important to be sure that your flowers and herbs are pesticide-free. Eat in small quantities and always consult with a health professional if you have particular health issues or are serving to small children. The basic rule is, if in doubt about a plant, don't eat it. If you want to learn more about edible flowers, there are some good guides online. You can find two here and here. 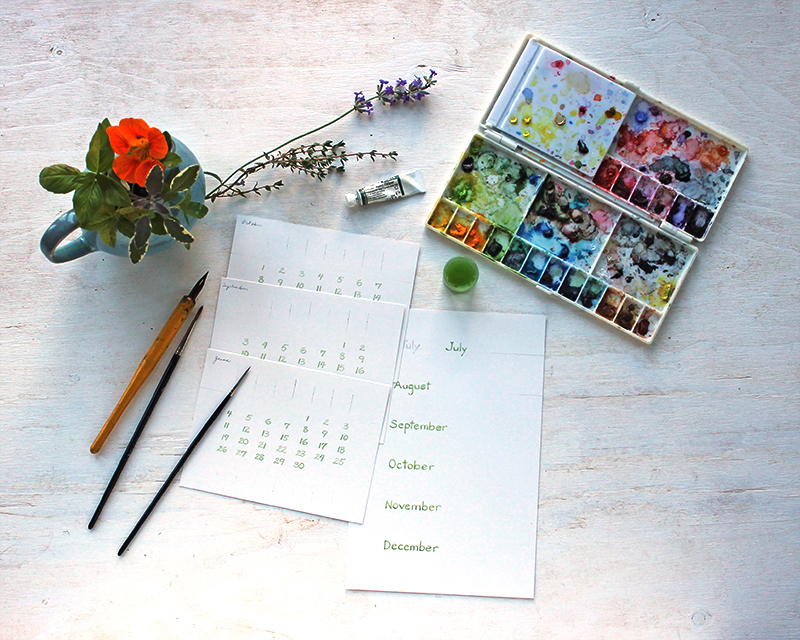 I am happy and proud to introduce my first Trowel and Paintbrush calendar! 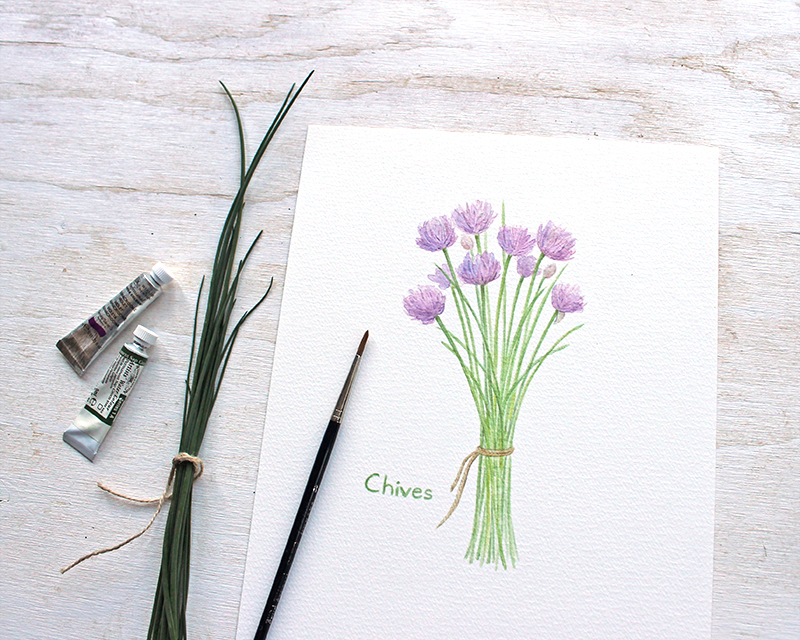 It's twelve months of herbs and edible flowers featuring my botanical watercolour paintings. I started working on this project a year ago. I was encouraged by an artist friend (thank you for the nudge, Brenda of @cattailswordwork) to think about doing a calendar. I quickly figured out my theme: herbs and edible flowers. I already had six herb paintings finished. I started to work on six edible flower paintings hoping to have it ready for 2016 but I underestimated the time it was going to take me. Rather than introducing a rushed effort late in the season, I decided to make it a 2017 calendar. I did some finessing of the edible flower paintings early this year. In the past few weeks, I hand lettered the months and days in watercolour. Some of lettering was done with a fine paintbrush, some with a pen nib dipped in watercolor paint. I chose 'Mint' for the January page as it seemed to fit with a fresh start. 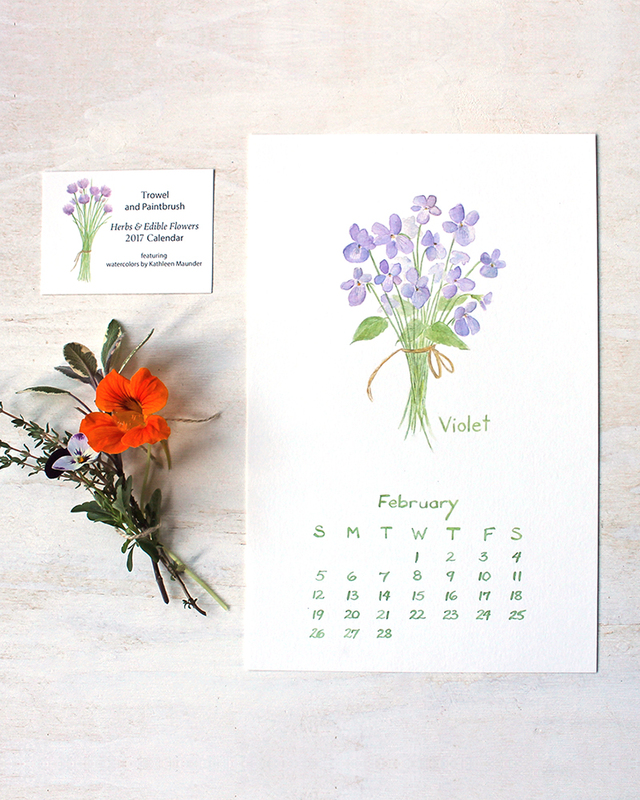 The sweet violet bouquet seemed to be perfect for February, aptly so I found out later as the violet is February's birth flower. I chose 'Thyme' for March because time marches on. (Sorry to be corny but it's true! Sometimes I need to amuse myself.) I placed my viola and pansy painting as the July image since that's when my birthday is and violas and pansies have lots of family associations for me. Sage is on the December page as it is so often used in holiday meals. I've printed the calendar in my studio on beautiful paper with the same care and attention I give to everything that I produce. As a bonus, I also created an accompanying page which describes some common uses of the herbs and flowers featured in my calendar. 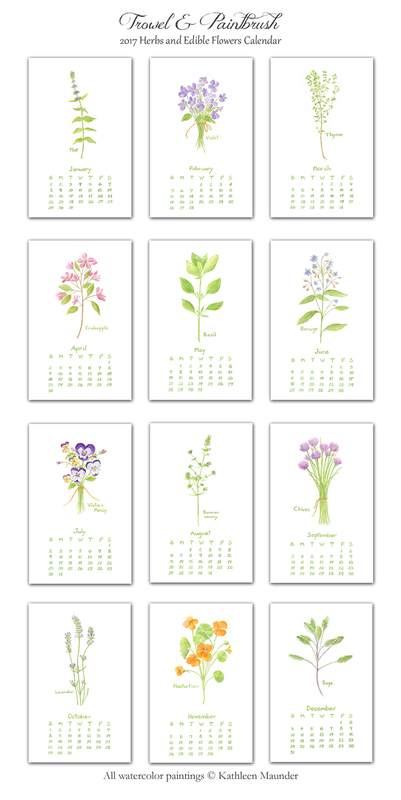 The calendar would be a lovely gift for a gardener, cook or nature lover. Or you may want to buy it for yourself! 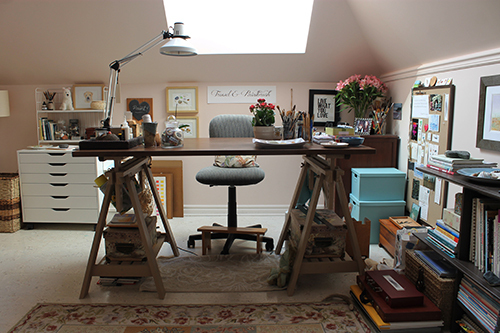 It would brighten up a kitchen nook or an office space. I sell it without a hole at the top centre which is perfect if you want to display it with a clip, clothespin or washi tape. Or I can punch a centre hole for you so you can loop a piece of twine or ribbon through it. It was so much work but I am thrilled with how it turned out. I really hope you like it too! 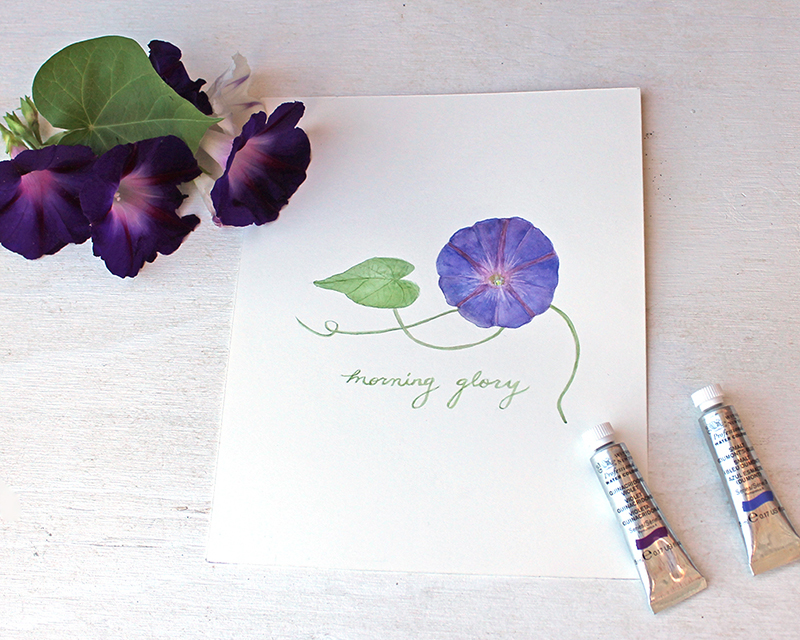 The morning glories in my garden inspired me to do a little watercolour. I have a stack of paintings from the past few months that I hope to convert into prints in the weeks ahead and this will be one of them. My garden is shifting towards autumn. I want to paint it all but I don't have the time these days. 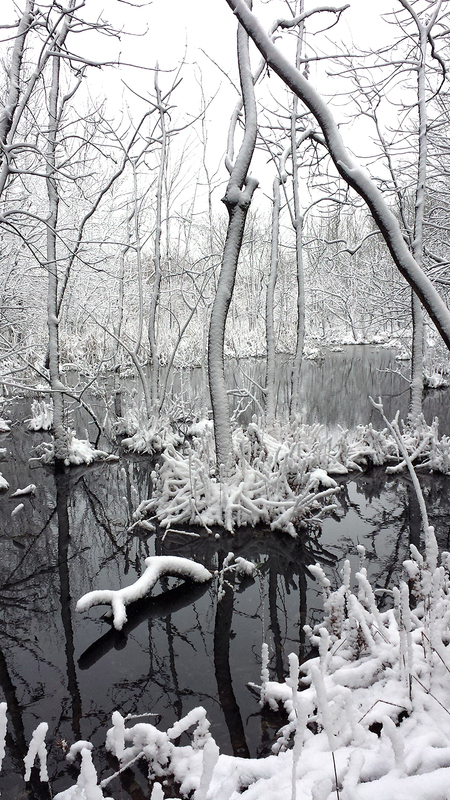 I'm trying to take lots of photographs to use as references and inspiration during the long winter months ahead. I bought some pots of chrysanthemums yesterday, a sure sign that the seasons are changing. I sometimes wish you could freeze moments in the garden and get things to slow down and linger a little bit longer. It goes too fast. 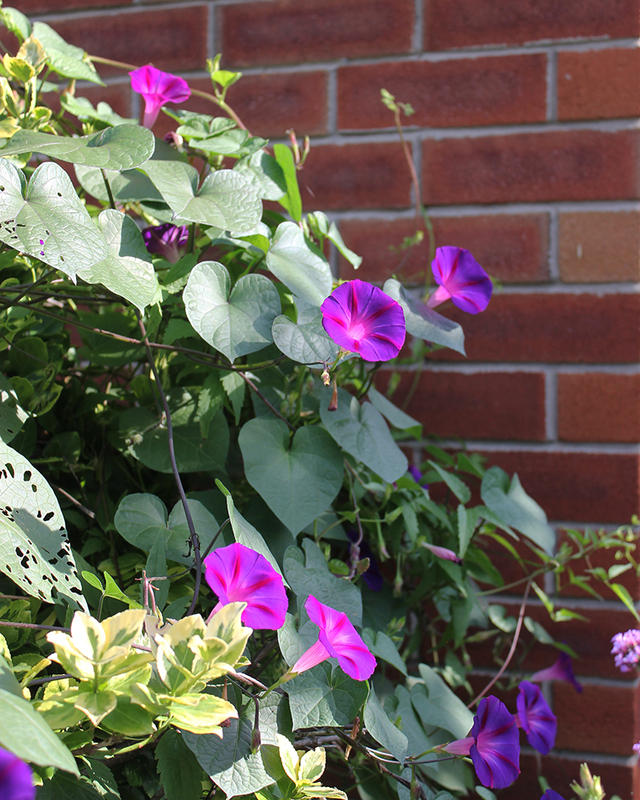 The morning glories are looking absolutely glorious at the moment. I truly understand where their name comes from. I took this photo this morning. They look like the light is coming from within them. 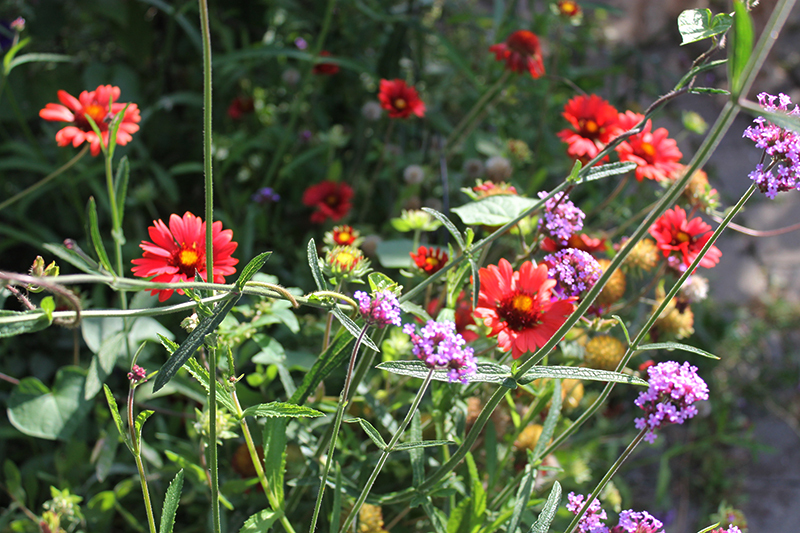 This is a tangle of flowers that are growing near the morning glories: gaillardia and verbena bonariensis. If you asked me to list my favourite colours in the garden, red wouldn't be one of them. However, I absolutely adore this combination of red and light violet. I have to tell you something else. I have the worst mental block for 'gaillardia'. I have to look it up, every single year. I always have to remind myself that as we are approaching autumn here, that my friends in the southern hemisphere are enjoying spring! In the north, we are dealing with the wistfulness of knowing that our gardens will soon be going to sleep and you are experiencing the joy of spring flowers! 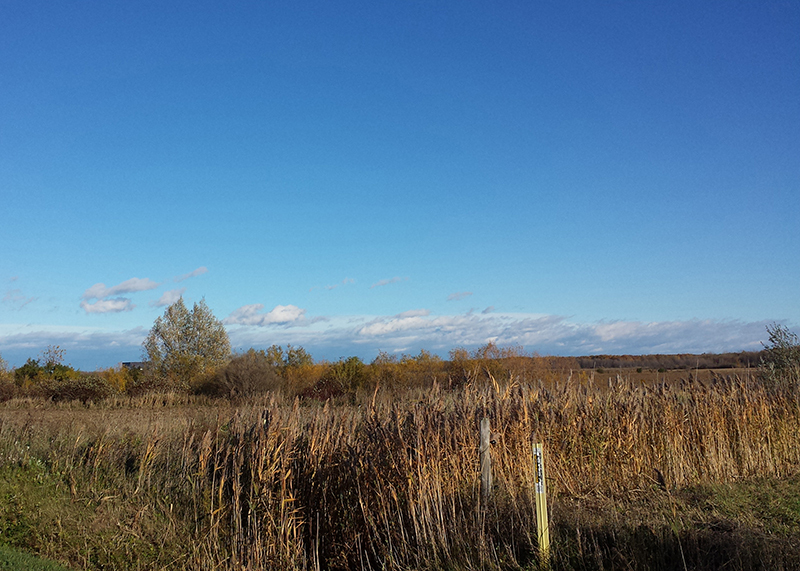 For the moment though, in the Montreal region we are experiencing unseasonably warm weather. I'll leave you with one final photo of my morning glory painting. I hope you are enjoying nature wherever you are and whatever the season. Meeko and the morning glories. Ha! I think that would be a good name for a band! 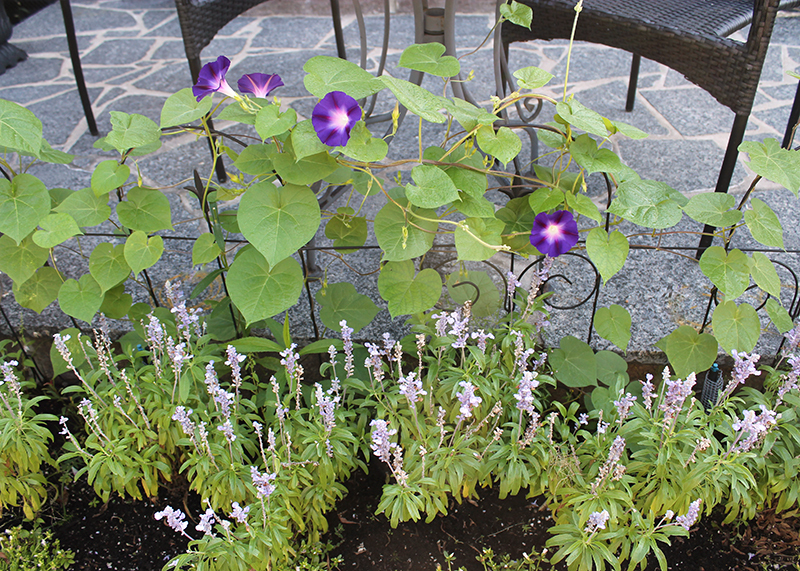 These morning glories reseeded themselves from last year. 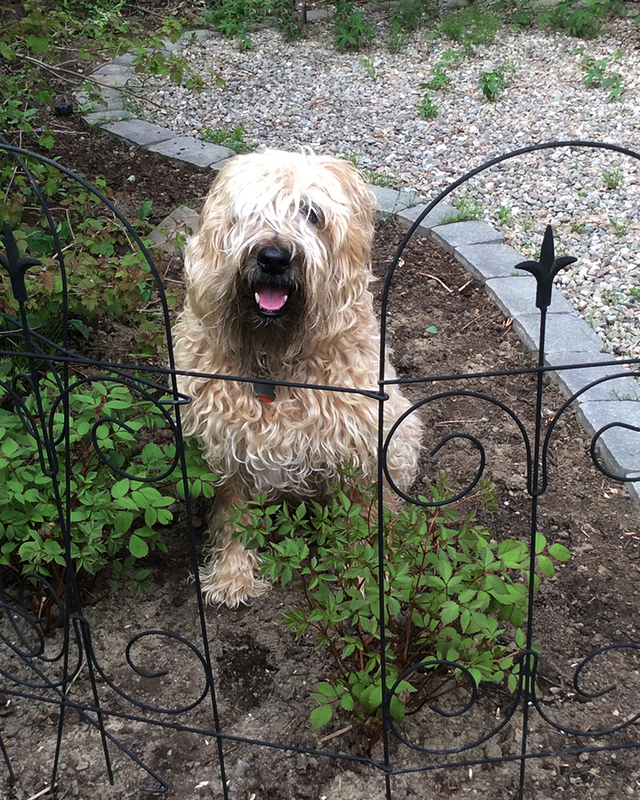 As they've grown, I've guided them towards the little fence that backs the flower bed. They've twirled and curled around the wire and look so pretty. 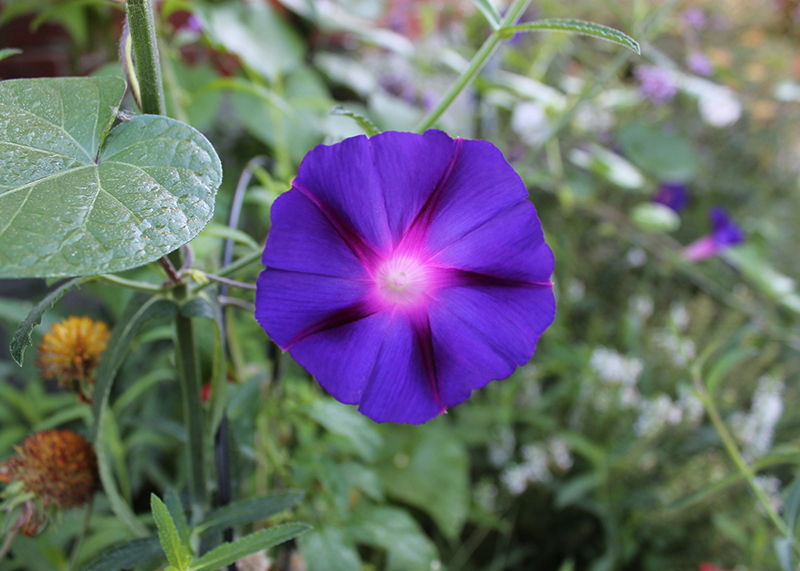 I didn't grow morning glories for a couple of years when Meeko was a pup. 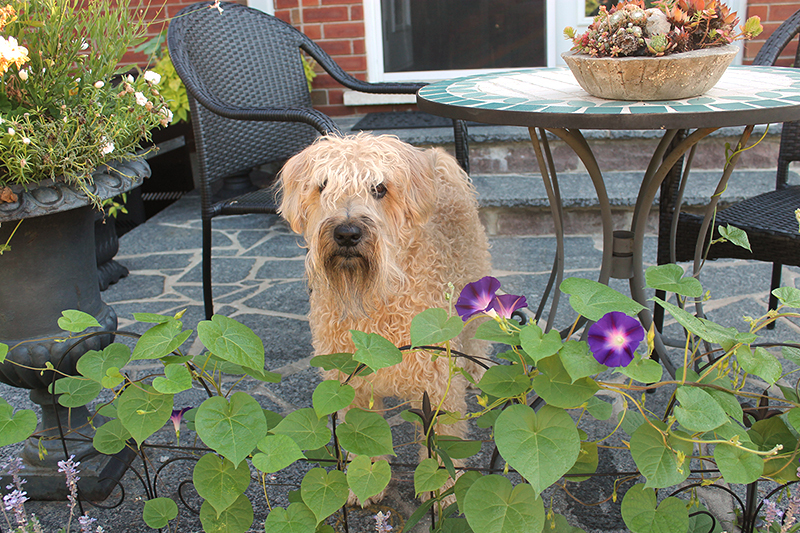 In those days, he couldn't pass a plant without trying to take a bite and morning glories can make dogs sick. 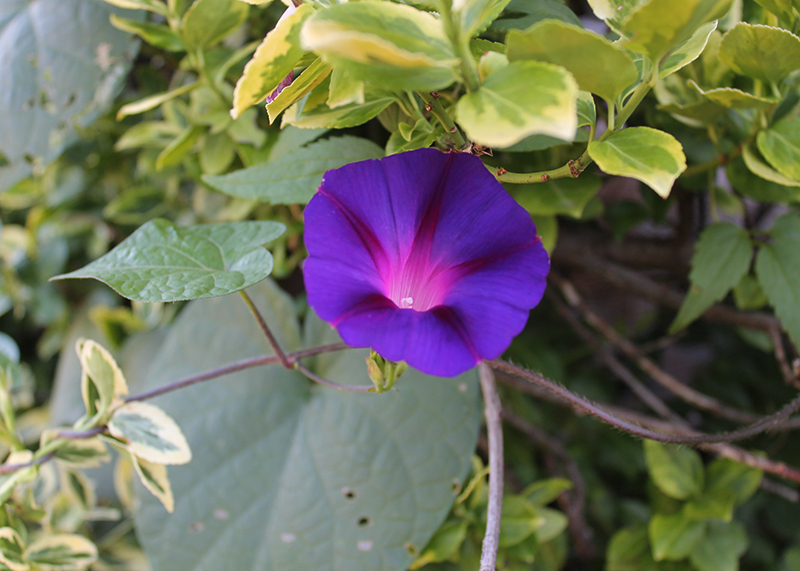 Now he ignores most plants except for grass so I'm able to grow morning glories in my garden again. The blue-purple of these flowers is one of my favourite colours. I love any warm blue tone. The morning glories have created the perfect backdrop to the light blue salvia. 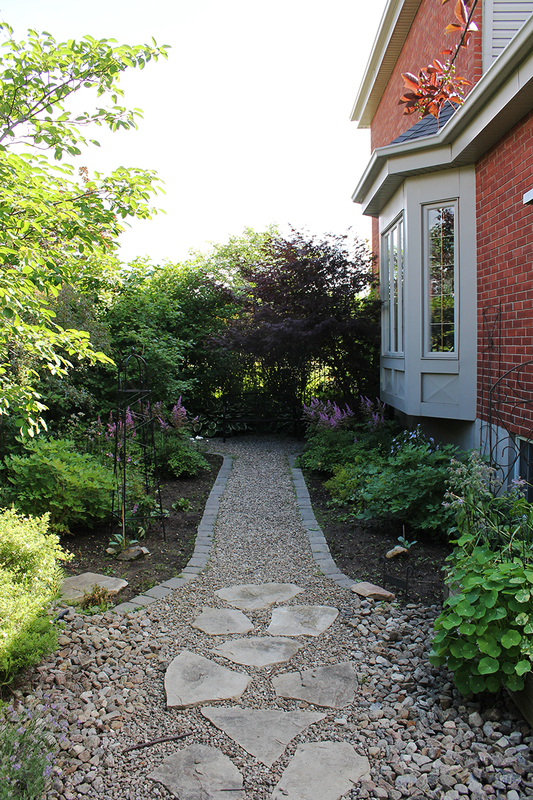 I love when the garden leads the way. 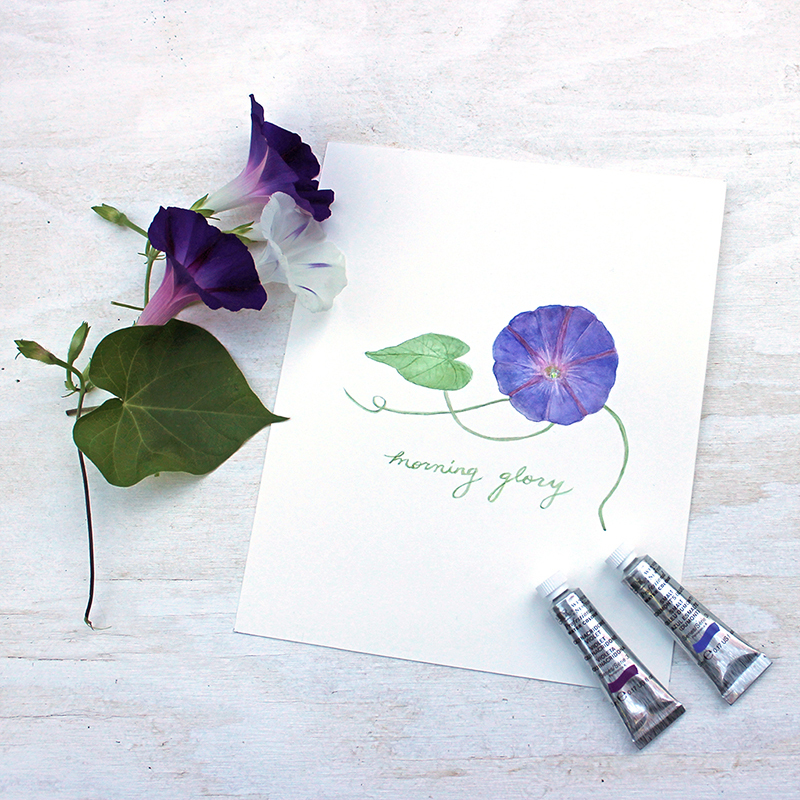 There is something very special about morning glory blooms. I think they look like little lanterns, almost as if the light was coming from within them. So very beautiful! I am finally back gardening! It was hard to set aside so many cherished activities the past couple of months as I waited for my neck to get better. The good news is that it is improving with physiotherapy. The bad news is that the reason it was vulnerable in the first place is that I have osteoarthritis in my neck. That was hard to accept (especially when I got the diagnosis a day before my birthday) but I suppose finding that out is a good thing as I am learning to be kinder to my neck and not to take it for granted. 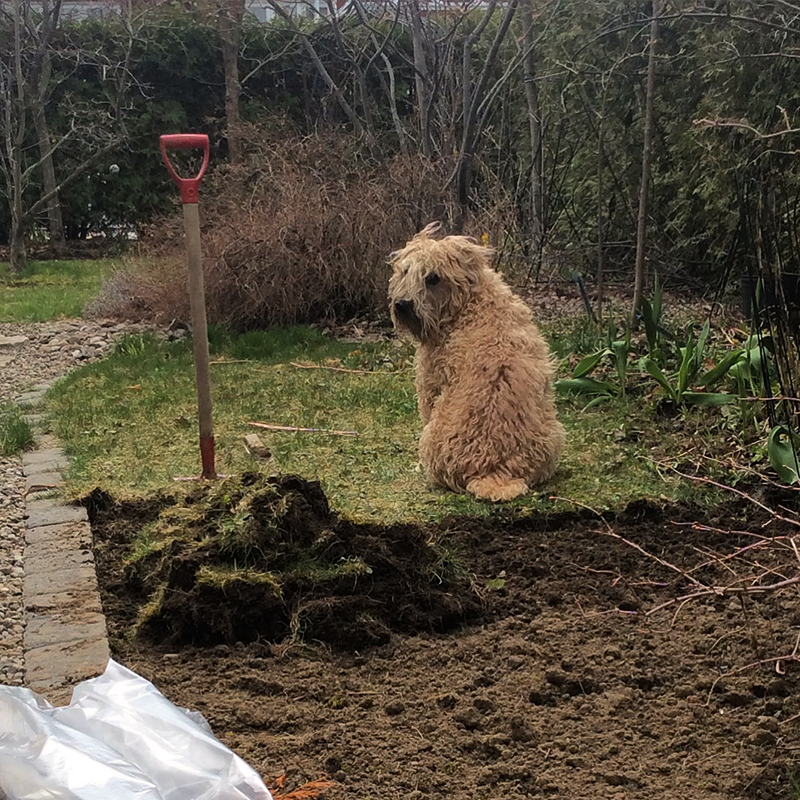 Back in April, I started a big project: revamping the shady garden at the side of our house. The pathway was already there. 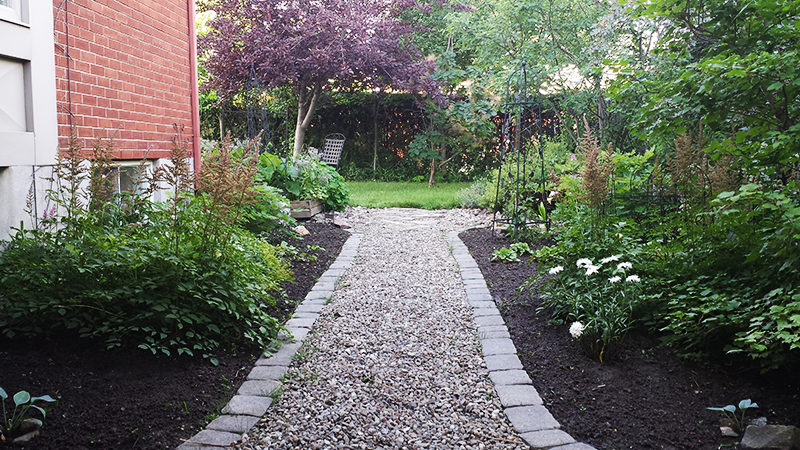 I created it myself six years ago (paver by paver and wheelbarrow-full of gravel at a time). 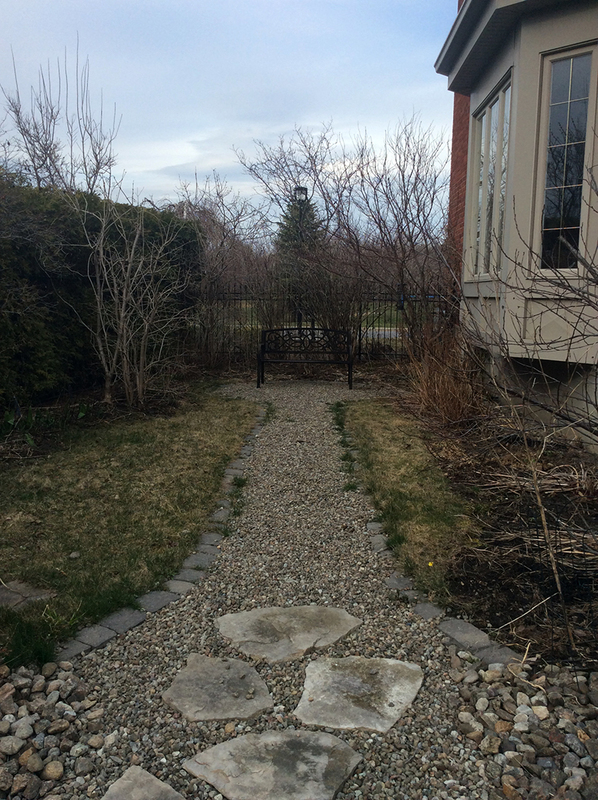 I still love the pathway but I wasn't happy with the garden. It was especially hard not to like it as it's the view from our dining room window. This is what it looked like in early April. 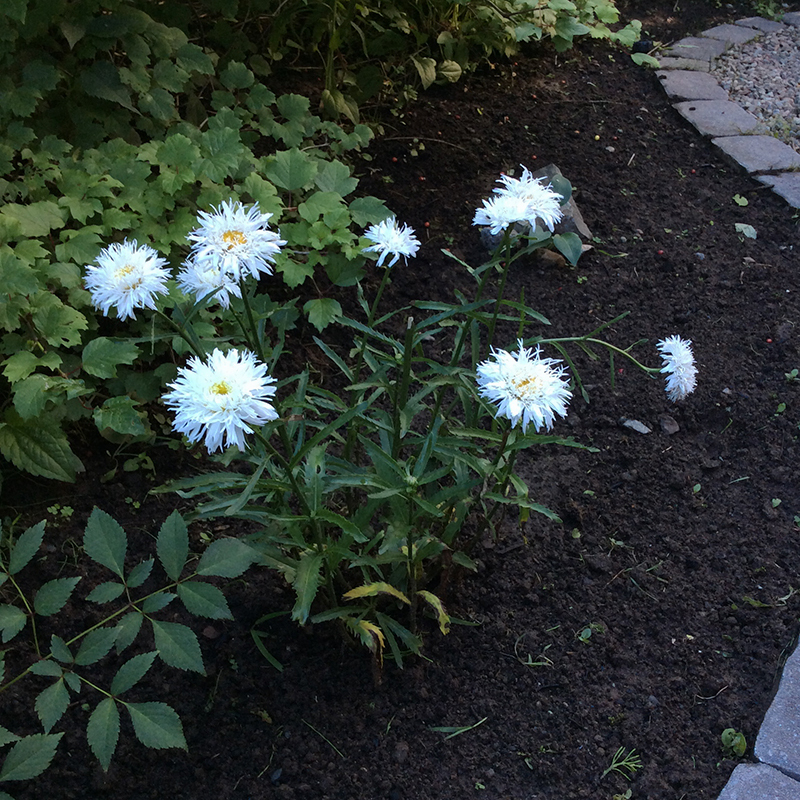 I completely removed the not-so-great grass that bordered the narrow flower beds. It was a big job but Meeko helped (sort of). I loved this photo of Meeko so much and the way he was looking at me over his back that I painted him in late April. Cutie pie. 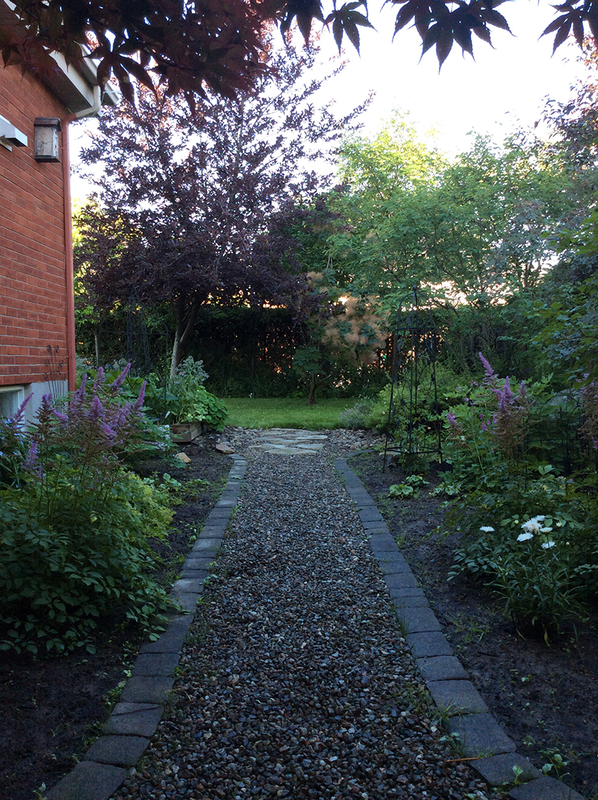 Once the sod was removed, I added good soil, divided the perennials that were already there (bleeding hearts, astilbe, lady's mantle, masterwort, turtlehead, sidalcea, hostas) and rearranged things. I also removed a huge shrub that was past its prime. When I was doing all of this work in April and early May, I was kind of feeling like Superwoman. Well, guess what? I'm not. I'm human after all. An aging human, my neck reminded me in a not very subtle way. The garden waited for me while I adjusted my pride and learned to treat my neck better through improved posture and daily exercises. In the past two weeks, I was finally able to finish my garden project. 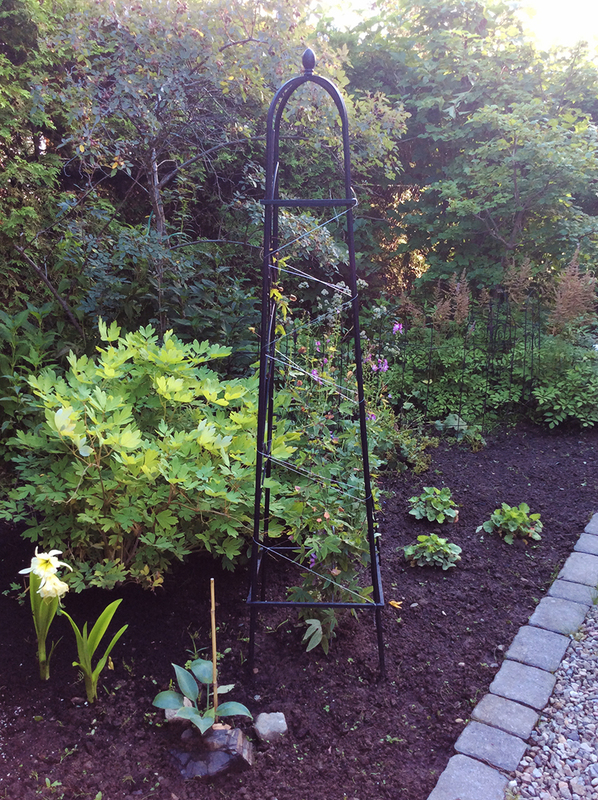 I weeded, added a few new perennials (coral bells and a shasta daisy) and planted an annual passionfruit vine in a pretty obelisk that my husband Jocelyn gave me for my birthday. Some of the new additions need to fill out a little but now I absolutely love looking at this part of the garden! It feels peaceful and serene. I am happy to announce that I have reopened my shop after having it closed for a month. Yay! I look forward to gardening and painting more in the weeks ahead and sharing my efforts here and on Instagram. Thanks so much for being here! 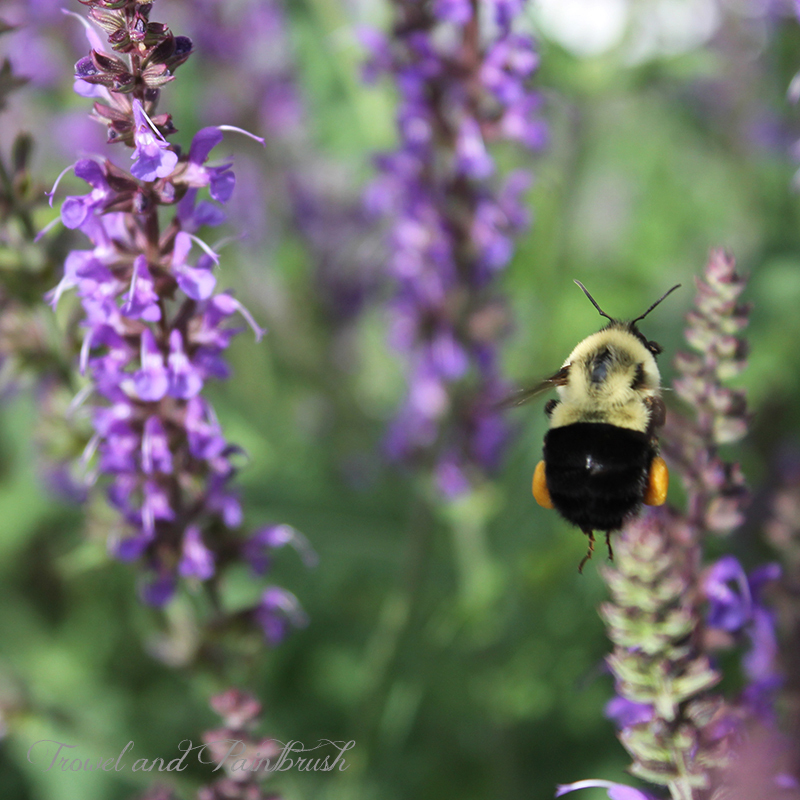 The bees are absolutely in love with the salvia in my garden. I don't remember planting this particular salvia where it is. Tall salvia at the very front of a flower bed? Hmmm. I constructed a Dr. Seuss-type rhyme it in my head. I did not plant them there at all. I'd never plant something there so tall. 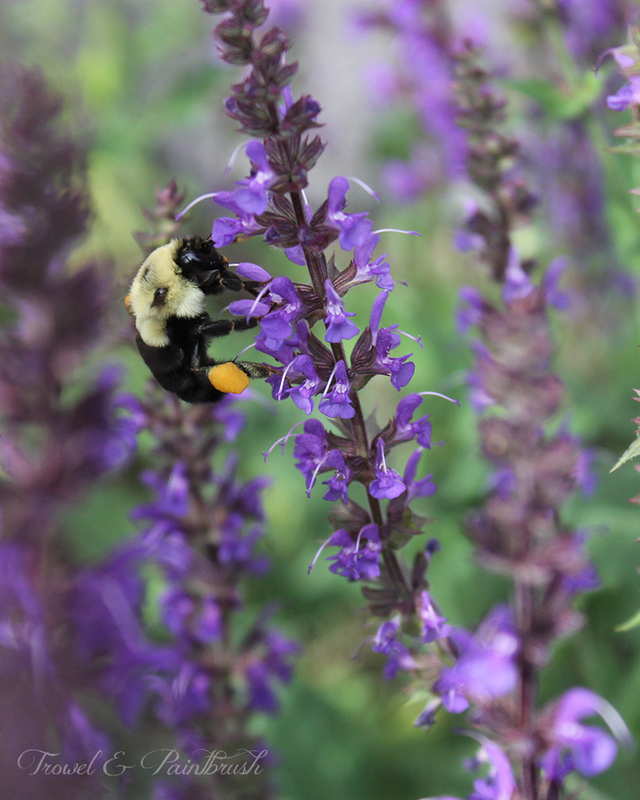 But the salvia is there and the bees loves it and that makes me happy. So the bees have been busy but I haven't, at least not in a normal way. The past month has been a bit odd. In mid-May, I injured my neck while pruning the sides of the tall cedars that surround our garden. It seemed like a normal strain at first but then, a week later, I woke up with neck spasms which I had never experienced before and don't wish on anyone. If I needed a reminder of the neck's function, I had it. It's involved in most every movement. I couldn't drink a glass of water, look down to to gauge my steps on the stairs or do pretty much anything else without triggering a painful spasm. Within a two-hour period, I had forty spasms. I saw a doctor and after two days of medication, the spasms disappeared. Unfortunately, the ongoing stiffness and occasional pain didn't. In late May, Chloé was sick for over a week with a bad virus. That was worrisome. She missed a week of school and two final exams. We were very relieved when she finally started to feel better. The week after Chloé was sick, I had to have an unexpected biopsy. I am happy to say that the biopsy results came back negative although my brain has taken several days to regain its focus. Oh stress, you are powerful! My neck? Well, it's much better than it was but still not normal. It makes me feel grumpy and frustrated. I am going to see a physical therapist on Monday. I realize how much I took it for granted as now I am very conscious of its movement. I didn't paint for four weeks. I've been on social media only in a sporadic way. Partly because of my neck. Partly because I had lost my focus with everything else going on. I've done bits of things. Bits of gardening. Bits of computer work. Bits of admin work on my shop. I've missed things. I'm sorry. Yesterday, I realized that this whole not painting thing was not going to solve itself. I just had to start painting again--maybe in shorter sessions. Then I couldn't decide what to paint. It's amazing how not painting for a while can do a number on your head, or at least mine. I start to feel like I can't paint. So I decided to work on an unfinished painting of irises that had been waiting in my drawer. It felt really good to have a paintbrush in my hand again. 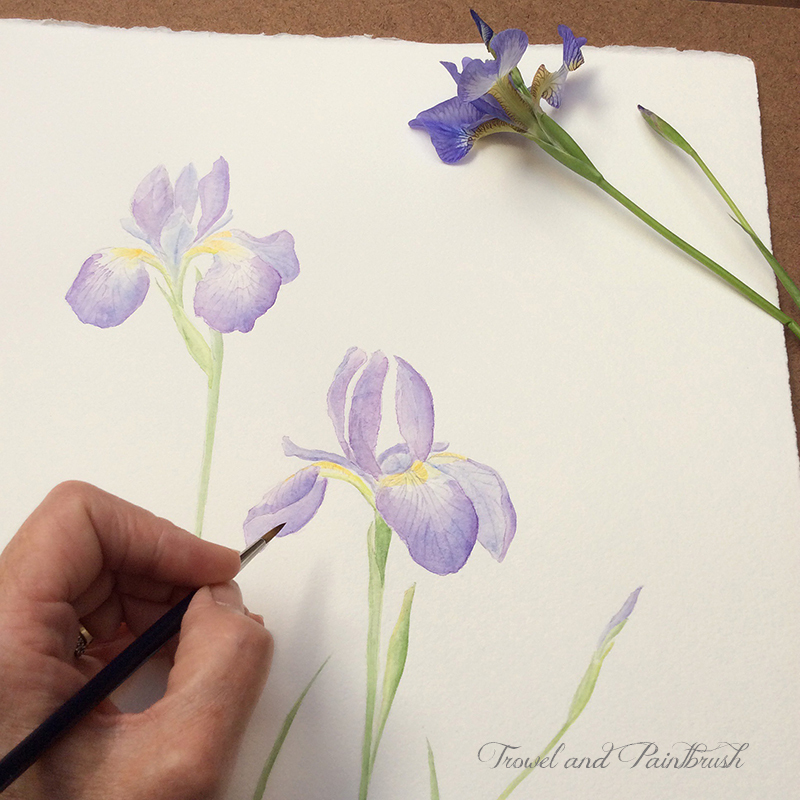 I've always loved irises so this is the perfect subject to ease me back into my painting routine. And guess what? I still can paint! All of this is not to complain, just to explain and share. I look forward to painting, posting and participating more in the weeks ahead! Here's a little poem in honour of my busy garden friends. Dost thou know how they are fair? Hast thou aught of joy in these? Leave thy clovers tumbled o'er! What's a lily? What's a rose? Hiving food for drones to eat. Oh, thou silly, silly bee! Idle here and learn of me! One of the things I have been trying to do as often as possible the past couple of years is to create sets of images when I paint. It's not something that I necessarily find to be intuitive. Often I want to paint one thing and then for the next painting, do something quite different! But by trying to offer more sets of images which I think is helpful to customers, I am finding that I do enjoy painting series. 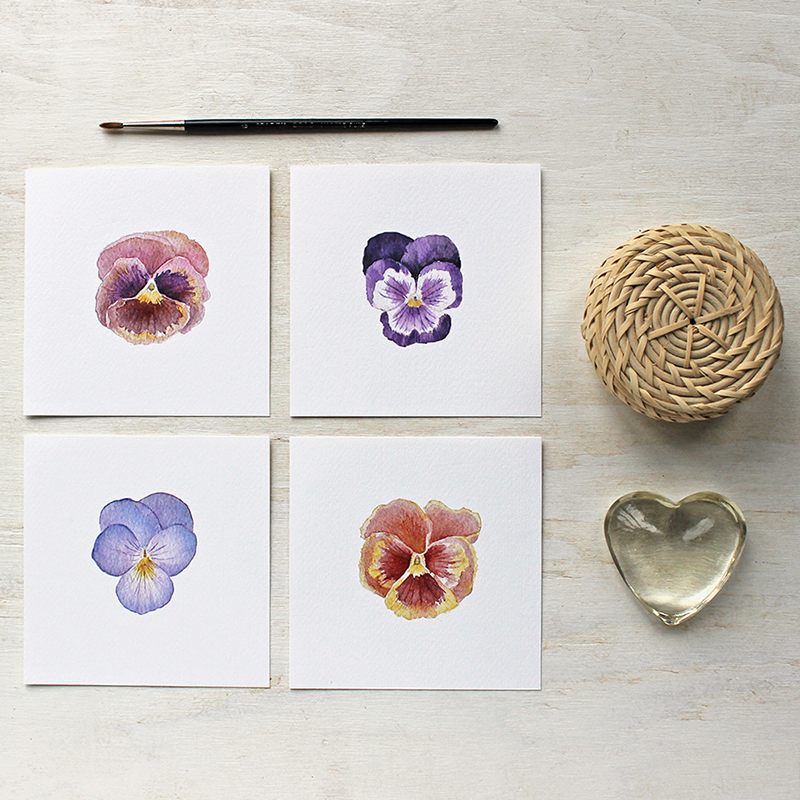 This is one of my favourite sets of prints that I currently offer in my shop: my set of four pansy prints. I introduced this set a few months ago but I have pansies on my mind these days because of all of the planting I am doing in my garden! Anyone who has known me for a while is aware of what a soft spot I have for pansies. One of my grandmothers was named Viola. 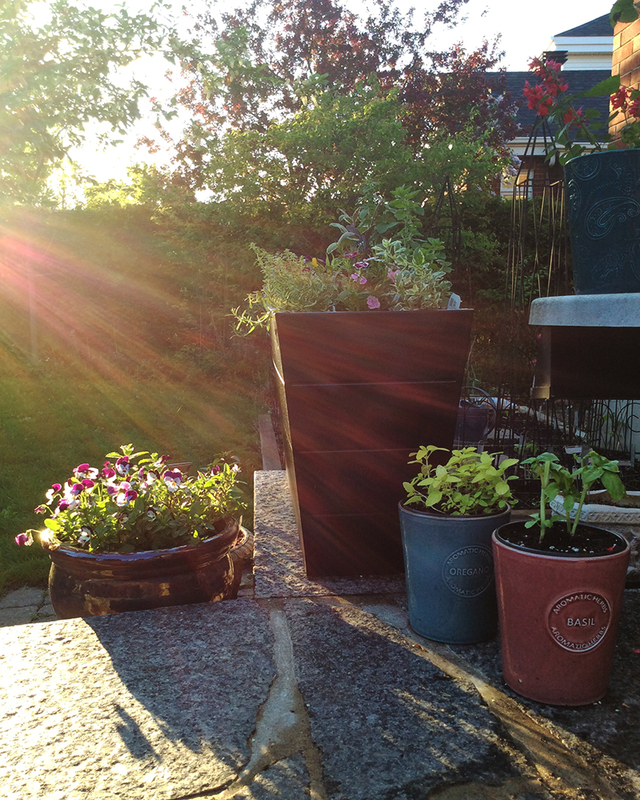 Here's a photo of my recently planted herb pots on our back porch taken in the late afternoon light. Of course, I had to add a pot of sweet little violas! You can view all of my print sets here. I hope to introduce more sets this year. I have several paintings in my studio just waiting to be converted into prints. As with all of my sets, you can also opt to buy the prints individually or to make your own grouping. And now back to planting! 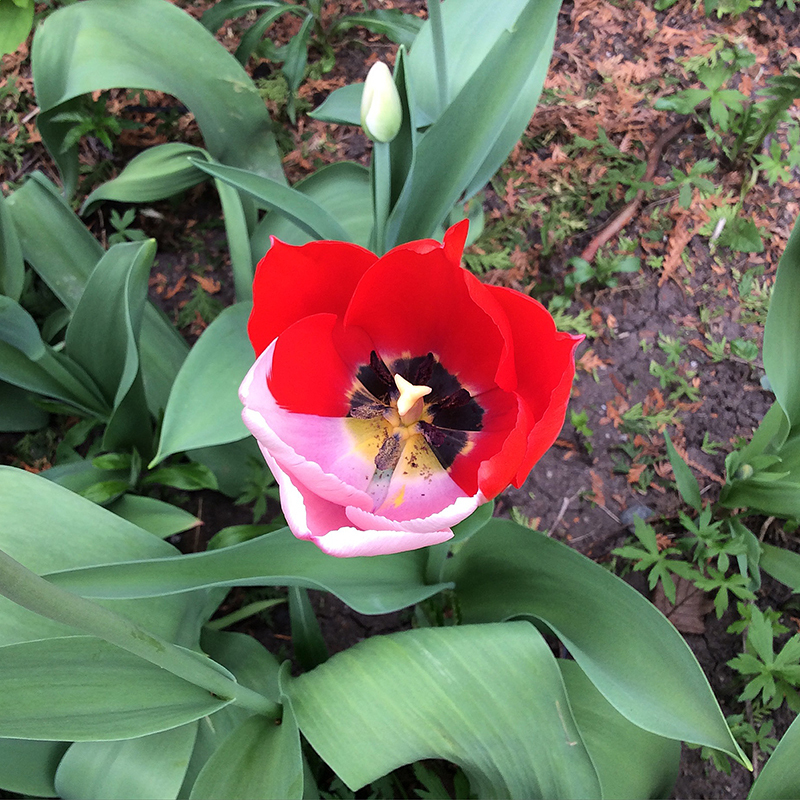 This spring, I've had one of the prettiest tulip displays ever in my garden. 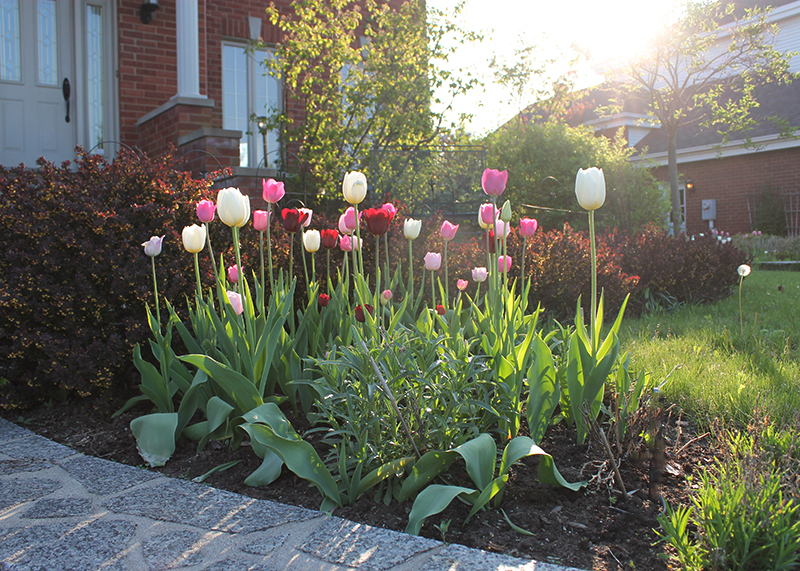 The mild autumn we enjoyed here in the Montreal region meant that I had more time than usual to plant spring bulbs. I bought a lot of bulbs on sale in November and planted them. In December, the earth was still workable so I bought more! Lots of bulbs planted means lots of spring flowers! 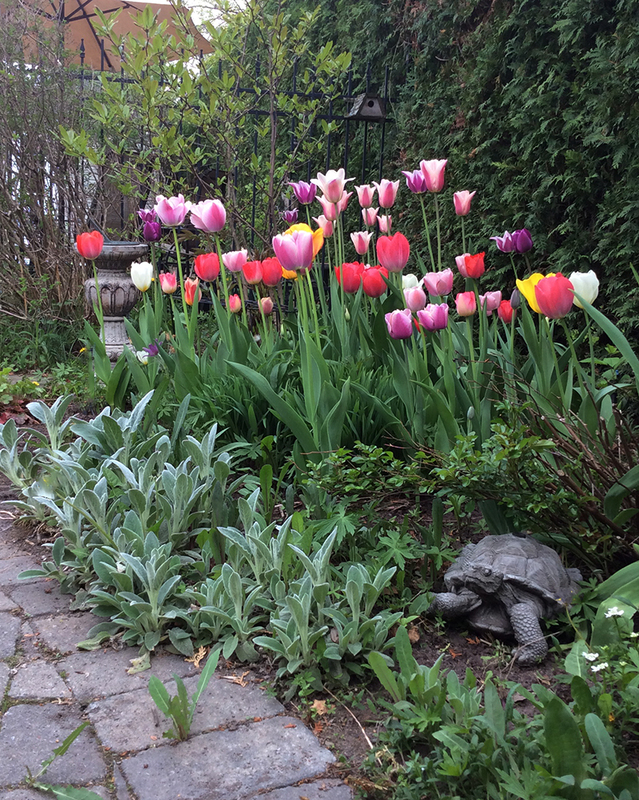 In the photo above, you can see the early stages of the tulips in my back flowerbed. The elegant pink-striped ones in the back are 'Ballade'. They have been there for several years and I love them. The multi-coloured mix in front was planted this fall. On Instagram, I mistakenly said the mix was called 'Monet's Garden'. This colourful mix is actually called...wait for it..."Long-Stemmed 2 Months of Flowering Tulips Mixture". 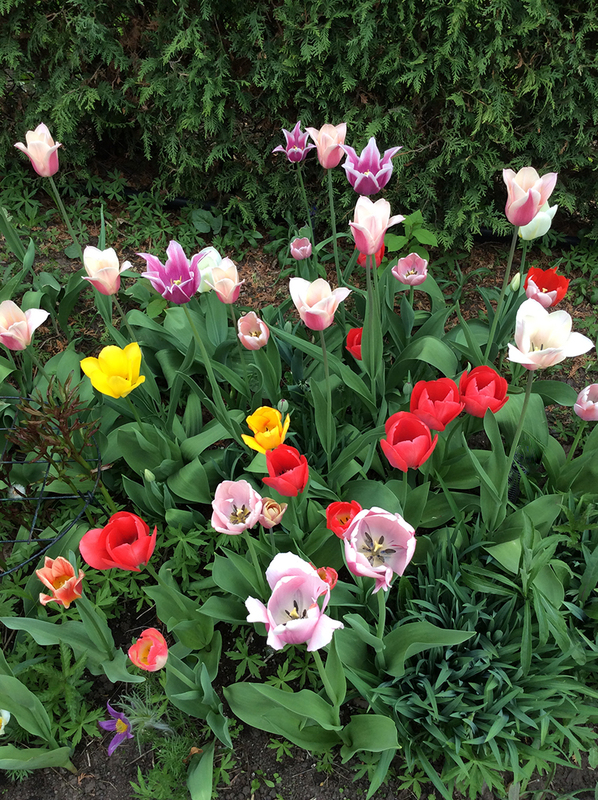 It's certainly not a very poetic name but it is a very diverse and pretty combination of tulips. With the very warm days we have been having recently, a two-month display seems overly optimistic but I am enjoying every single day of them. 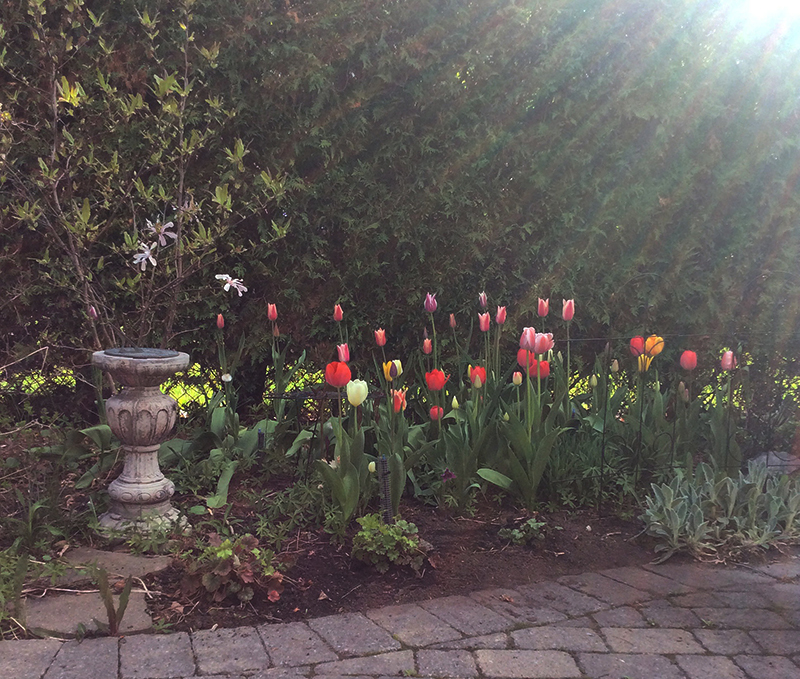 This particular flowerbed is visible from our kitchen window and back door so I have been making frequent trips there to gaze out at the tulips. In the more recent photos below, you can see how the stems are taller now and the blossoms more full. Can you tell that I'm in love with them? Sometimes nature give you something a little extra. In the middle of all of these tulips was a very special one. A renegade. Isn't it amazing? 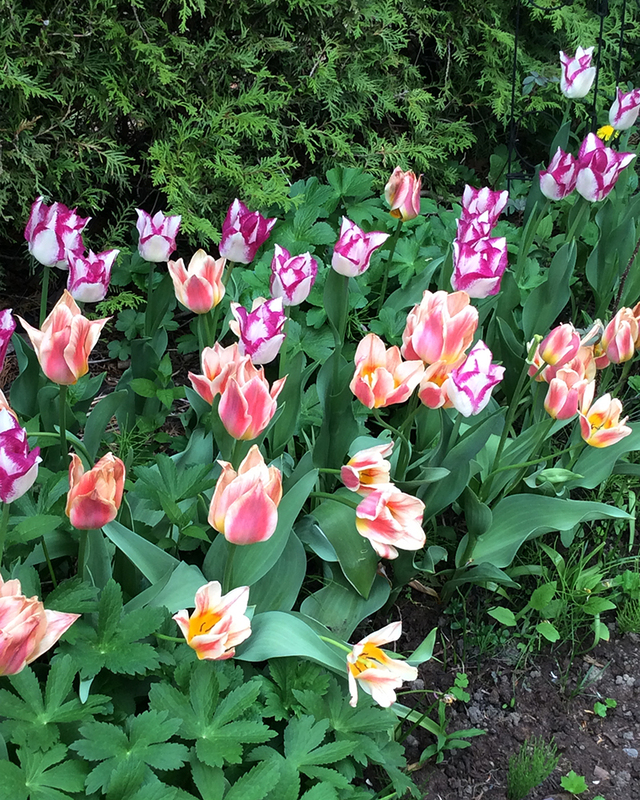 At the side of the house, I planted yellow-pink and purple-toned tulips together and they look like they were made to be friends. 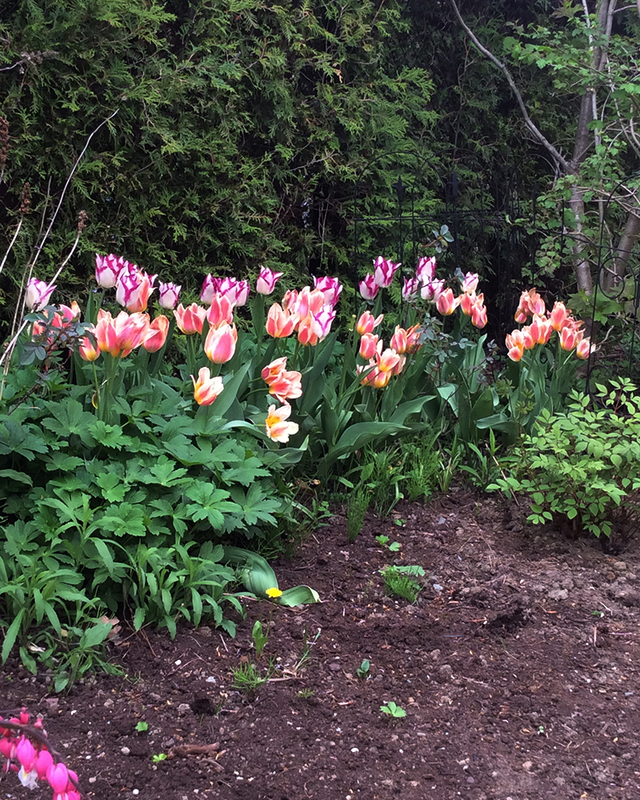 The pinks ones are a bunch-flowering tulip called "Quebec". The purple-edged ones are a Triumph variety called "Affaire". Both types have multiple stems so it makes for a very full display. I can see these ones from our dining room window. If it sounds like I spend a lot of time looking out of windows at my garden, I do. One of the ongoing disappointments I have about many tulip bulbs is how they disappear over time. The silver lining is that it means that I can adjust and renew the look of my flowerbeds by adding more bulbs each fall. Every spring brings new surprises. I have many other tulips planted here and there in the garden but wanted to introduce my 'newcomers' to you. 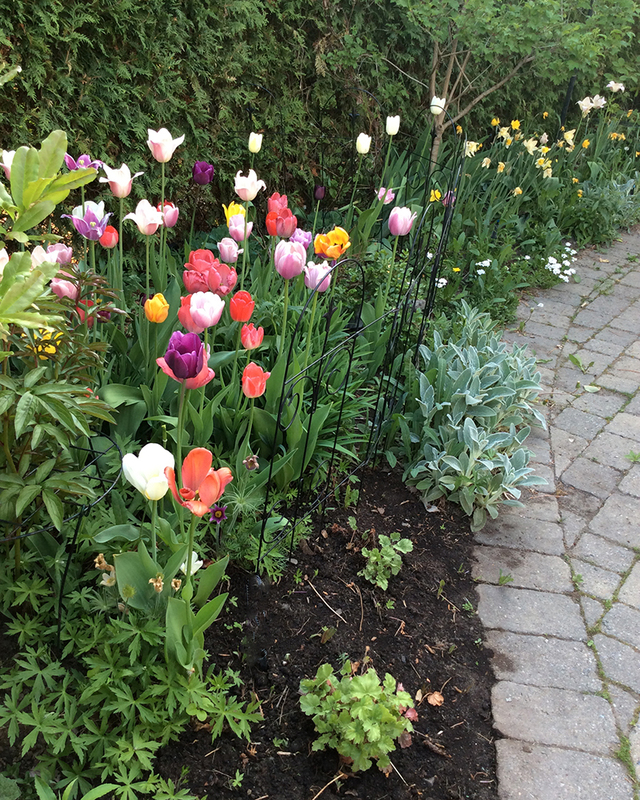 Here's the "Monet's Garden" mix of tulips planted in front. I have to admit that I bought them mainly because of their name but I am very happy with their refined and elegant appearance. If you'd like to see the watercolour images that include tulips in my shop, you can see them here. You may have noticed that I've made some small adjustments to the design of my blog. It's a little wider than before and my photos are also bigger. I hope that you like these small changes. I thought of changing my blog header but I still like it. It's been the same since 2011 but it feels like me. It's one of my favourite watercolour paintings that I did many years ago. The original hangs in our living room. Today, I also managed to solve a problem I've had on Blogger since I began it in 2011! My photos would automatically indent from the left so I had to manually remove a piece of code after adding each and every photo! It was especially annoying when I had posts with several photos. I found some code that automatically corrects the problem! Hurray! It gets added in the CSS portion of the blog template. I also found some code that resizes my photos to fit my blog columns, also added to the CSS. Two internal changes that make posting a little easier! I'm sharing in case anyone else is struggling to solve similar problems. A week ago, I received some disappointing news. I had applied to a local arts and crafts show and wasn't accepted. I had a choice. I could wallow in sadness or I could do something constructive and move forward. 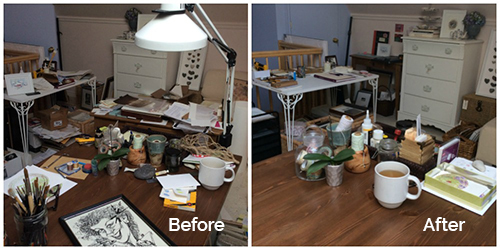 I did let myself wallow for about 24 hours and then I decided to embark on a major cleanup of my studio. I am a perfectionist and really do like when things look organized and pretty. Unfortunately, I don't really enjoy cleaning. I would far rather use my time to paint than clean, so things have a tendency to pile up around me. 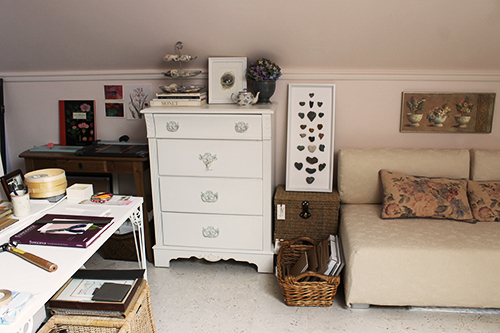 Last summer, my daughter Emma gave me a pretty white table from Ikea for my birthday. I added it to my studio without really taking the time to make it fit in. It displaced another small table which I left in the centre of everything. I had piles of paper, frames and shipping supplies on the floor. It was far from organized. Things were actually getting a little dangerous. 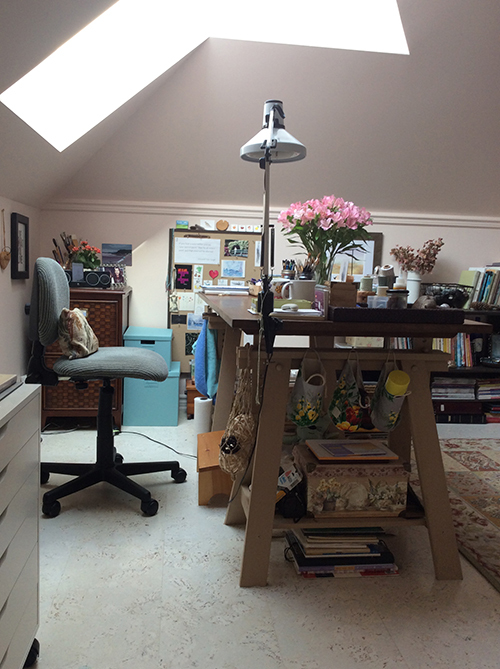 I've been brave and took some before photos to show you just how much my studio has changed. Some of these photos were taken in the middle of the process, so things looked even worse than at the beginning. 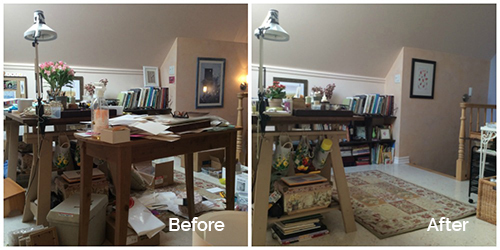 I had pulled things into the centre of the room to go through them. It was such a big job that I really wanted to give up about halfway through. I was physically tired and bored out of my mind. But I didn't and I'm glad I kept going. It took me a full week. 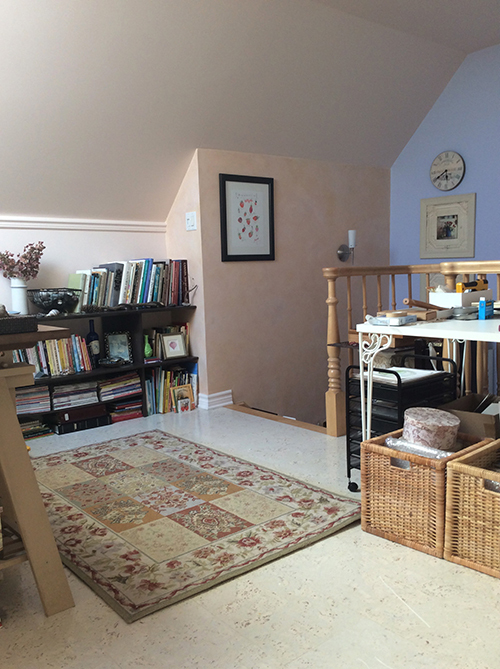 Here are some photos of what my painting studio looks like now. I printed the Trowel & Paintbrush sign with the hope that I would be accepted to the show but I like the way it looks on the wall of my studio. I also put up a couple of my nature collection prints on the wall. I love the new blue file boxes I got at Ikea. And, of course, I have fresh flowers. My painting table always has my paint, brushes and bits of my nature collections on it but now everything is neat and organized. I have pretty fabric bins made by Sonia of Cozy Memories tacked on the side of my table for storage. On my bulletin board beside my table I have the Van Gogh quote: "If you hear a voice within you say 'you cannot paint,' then by all means paint, and that voice will be silenced." There are also photos, postcards and business cards from artist friends. I recently put my Haworth Moor print up on the wall over my bookcase as it's one of my current favourite prints. 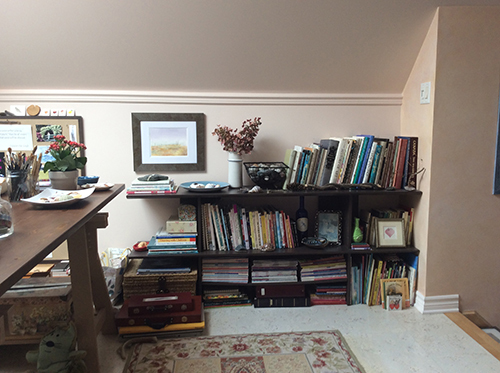 On the shelves, I have some of my nature finds, art books, magazines and illustrated children's books. I love the Alex storage unit from Ikea. 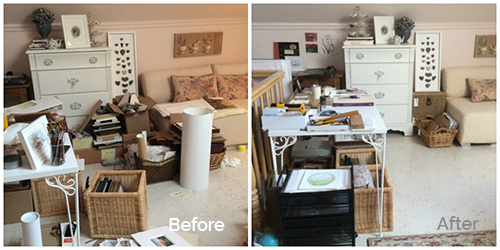 I allows me to store watercolour paper, supplies and some finished paintings. I've added a Falkhöjden shelf on top. Do you see my painting of Meeko? That's a Milou (Snowy) toy beside it. 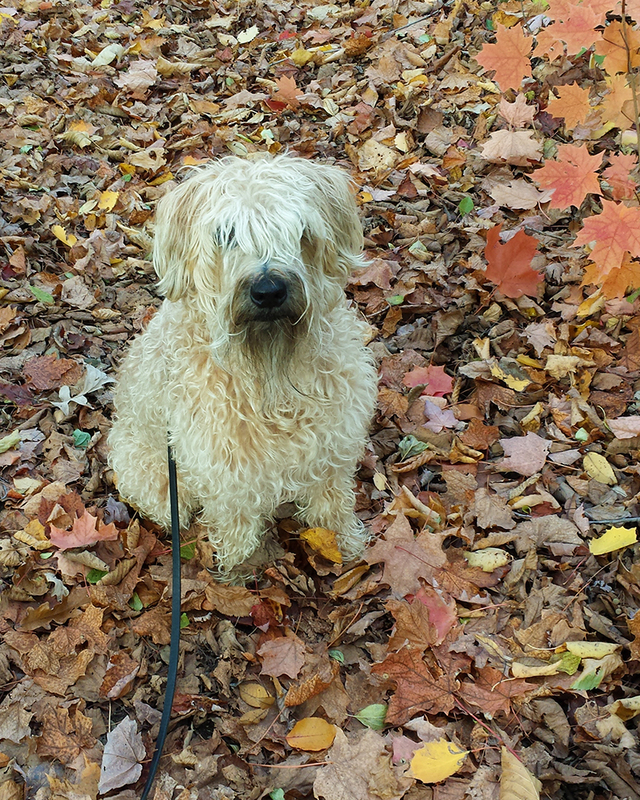 Hergé based the Milou character on a wire fox terrier but it reminds me of a certain wheaten. I made the slipcover for the daybed years ago but now it's freshly washed. 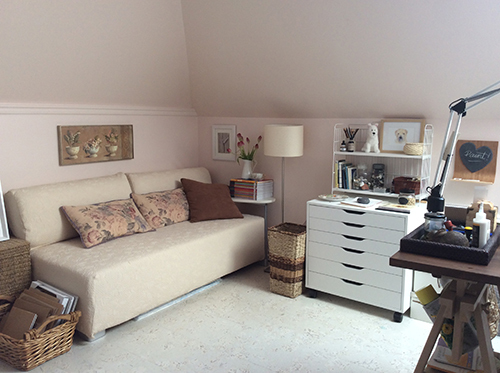 Having a sofa in the studio also provides a convenient place to store full sheets of watercolour paper. You can see them peeking out at the bottom. The dresser is where I keep my finished paintings. I have a huge number of them! To the right of it are my framed heart stones. I hot-glued some of my rock collection to the matboard of an Ikea frame. The bird nest watercolour is by Jody Edwards. 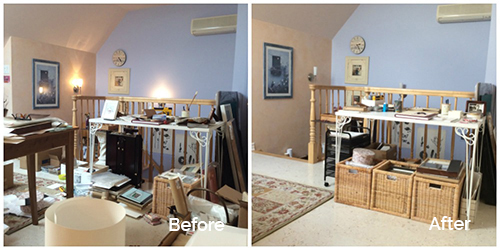 To the left of the dresser is the small wooden table that was previously floating awkwardly in the middle of the room. Now it's tucked neatly against the wall. I'll use it for cutting and scoring my note cards. One of the final touches I made to my newly cleaned studio was to frame and put up my beautiful original watercolour of strawberries by my friend Lucile Prache. My husband gave it to me for Christmas and I love it so much. 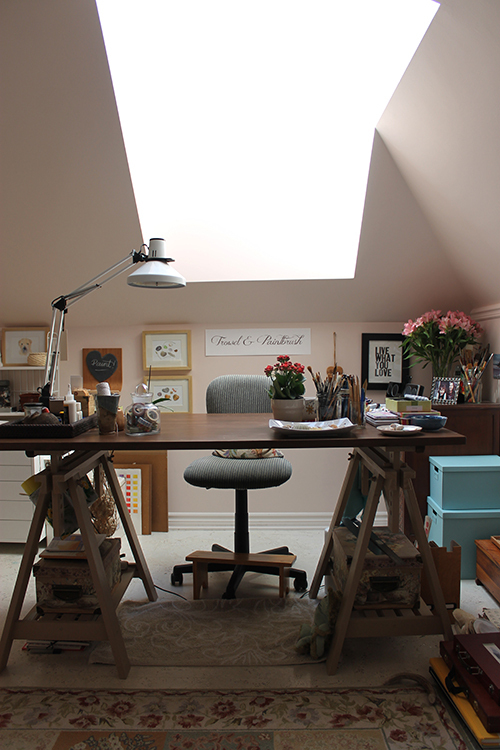 It feels completely different now when I climb the stairs to my studio. I feel lighter, like there's a weight off my shoulders. The air feels clearer. There's room to paint and even dance if I feel like it. Do you know what? I just might. If you'd like to browse through my art shop, it's here.